The combination of English concertina and clawhammer banjo seems unlikely – but in the hands of Alistair Anderson and Dan Walsh it becomes a mesmerising force, concertina rising high over banjo riffs, or the two instruments keeping pace note for note as they rip through American bluegrass tunes. The duo has been performing together occasionally for a while but have now recorded their first CD, Right at Home, to be launched at the beautiful Coquetdale Music Trust venue in Thropton, near Rothbury, on Sunday 9 July. Dan Walsh and Alistair Anderson are two of the most dynamic musicians in folk music who strike sparks off each other in their fantastic cross-generational duo. With repertoire ranging from Bluegrass songs to Northumbrian rants; from Jazzy ballads to Old Time reels their performance combines high energy with world class musicianship. 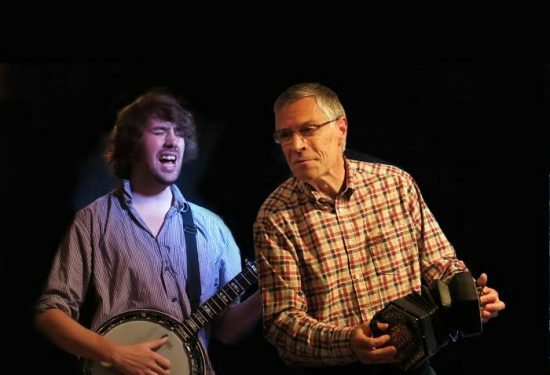 Alistair Anderson (Concertina & Northumbrian Pipes) has been blazing a trail for the music of Northumberland and beyond for close on 5 decades while Dan Walsh (Banjo, Guitar and Vocals) is fast establishing himself as one of the finest young performers around. Both open minded, thoughtful, musicians with love of both the traditional and the distinctly “off the wall,” they share a chemistry on stage which delights audiences and builds a very special energy. Tickets can be reserved by calling Chris Pentney at Sharper Than on 01661 842935 or on line: http://bpt.me/2941698 They will also be available on the door on the night and can be bought in person from Tully’s in Rothbury. Tickets are £10 (£5 students/ U19s). The concert starts at 7.30pm and door open at 7pm.